Evidences suggest that Cystatin C (Cys C) levels might be a biomarker in amyotrophic lateral sclerosis (ALS) diagnosis, but the conclusion is still in doubts. We conducted a systematic review and meta analysis of Cys C levels in cerebrospinal cord fluid (CSF) and peripheral blood of patients with ALS in order to further confirm whether or not Cys C levels is a biomarker in ALS diagnosis. The English relevant studies without year limitation were systematically searched in PubMed, EMBASE, Web of Science databases. The searched term contained "Amyotrophic Lateral Sclerosis" or "Motor Neuron Diseases" and "Cystatin C" and "Cerebrospinal fluid" or "CSF" or "Biomarker" or "Serum" or "Plasma" or "Blood". Observational studies reporting the associations between Cys C levels and ALS patients were selected to conduct a systematic review and meta analysis. Two reviewers performed the selection of this study independently. The Newcastle-Ottawa Scale assesses the quality and risk of bias of selected studies. Estimates were pooled using a random-effects model. The Cys C levels of CSF or peripheral blood in ALS patients compared with health controls (HCs) and several relevant neurodegenerative diseases (NDDs). Sixteen studies were included in our systematic review, 9 of them were selected to perform the meta analysis. Of these, eight studies measured Cys C levels in CSF and three studies measured it in blood. Cys C levels in CSF were significantly lower in ALS patients than in HCs (Hedge's g = -1.398, 95%CI: -2.43 to -0.36; p = 0.008), but there was no statistical difference between ALS patients and several relevant NDDs. No statistically significant difference in the Cys C levels of blood in the comparison between ALS and HCs. The correlation meta analysis presented no significant correlation between Cys C levels in CSF and age or disease duration respectively. Cys C levels significantly decrease in the CSF of ALS patients, but are not a specific biomarker for this disease. Cys C levels in CSF might be an auxiliary diagnostic biomarker of ALS. Amyotrophic lateral sclerosis (ALS) is a fatal neurodegenerative disorder due to the degeneration of upper and lower motor neurons, which characterized by the generalized skeletal muscle weakness and atrophy. About 90% of ALS is the sporadic ALS (sALS), 10% is the inherited ALS, also known as the familial ALS (fALS). At present, the pathogenesis of sALS has not been clearly known, although series of the studied results were reported by researchers [1-3]. Therefore, no any effective measures can cure or prevent the progression of ALS, the majority of ALS patients dies in 3-5 years after disease onsets. And early diagnosis of the disease is very difficult. The clinical accessory examinations that are helpful to diagnosis ALS are insufficiency besides electromyogram. For that, the biomarkers in the peripheral blood and the cerebrospinal fluid (CSF) could aid the early diagnosis and therapies of ALS because biomarkers might appear at the onset, progression and prognosis stages of disease. Thus, it is an urgently need to search a useful biomarker of diagnosing ALS, assessing the prognosis and conducting the clinical cured and prevented trial . Cystatin C (Cys C), an endogenous inhibitor of cysteine proteinase, has been suggested to play an important role in the nervous system repair following injury and disease [5, 6]. Cys C is extensively expressed in neurons, astrocytes, endothelial and microglial cells in brain respectively [7-9]. Some studies have reported that Cys C has a neuroprotective role in neurodegenerative diseases , it is thought to inhabit the diverse of cysteine proteases including cathepsins B, H, L and S, calpains and caspases, thus to suppress the activity of cysteine protease [10, 11]. Furthermore, the neuroprotective activity of Cys C induces the neural cell autophagy, which prompts the degradation of misfolded or unfolded proteins, prevents the accumulation of aberrant mutative proteins, ultimately prevents and eliminates the neurotoxicity brought to neural cells by them . The Cys C level in CSF is altered as the ALS disease progression in accordance with the localization of Cys C to Bunina bodies [13, 14]. Several studies have reported that the Cys C concentration decreased in the CSF of ALS patients compared with healthy controls (HCs) and the control with several relevant neurodegenerative diseases (NDDs) [15-17]. However, some studies reported that there was no difference in the Cys C levels of CSF in ALS patients in the comparison with health controls and controls with several relevant NDDs [18-20]. Based on the current studied evidences, the Cys C levels may be a potential biomarker in ALS, but the validity using the Cys C levels as a diagnostic or prognostic biomarker or differentiating ALS patients from controls still lacks the enough investigated evidence. In order to further confirm whether or not Cys C levels is a biomarker in ALS diagnosis, we performed a systematic review and meta analysis of Cys C levels in CSF and peripheral blood of patients with ALS. All relevant studies were identified besides the unpublished and non-English language studies. The results of this paper showed that Cys C levels significantly decrease in the CSF of ALS patients, but are not a specific biomarker for this disease. Cys C levels in CSF might be an auxiliary diagnostic biomarker of ALS. The protocol has been registered in the Prospective Register of Systematic Reviews (PROSPERO). Registration number CRD42017068235, is available from http://www.crd.york.ac.uk/PROSPERO/display_record.asp?ID=CRD42017068235. 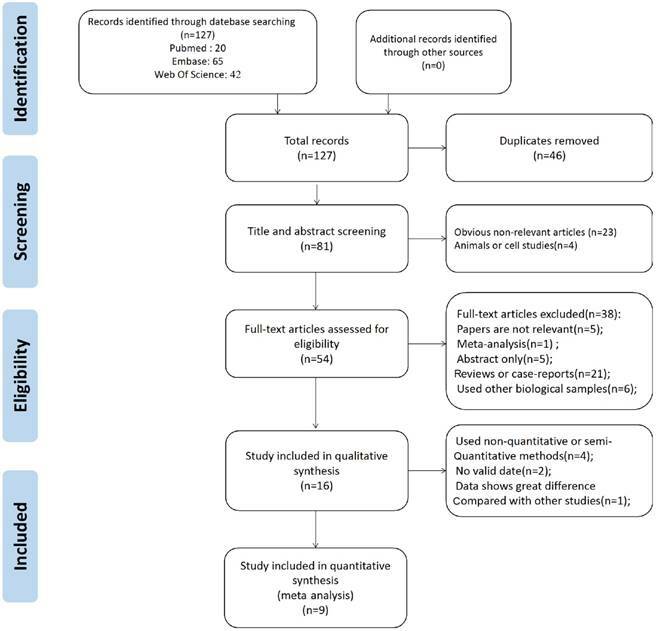 This systematic review and meta analysis was done according to Preferred Reporting Items for Systematic Reviews and Meta-Analyses (PRISMA) guidelines . Two researchers (Z.-Y and Y.-M) systematically searched articles published in PubMed, Embase, and Web of Science before May 24, 2017 using the following keywords: ("Amyotrophic Lateral Sclerosis" or "Motor Neuron Diseases") and "Cystatin C" and ("Cerebrospinal Fluid" or "CSF" or "Biomarker" or "Serum*" or "Blood"). We used Medical Subject Heading (MeSH) and Emtree terms used in Embase to retrieve literature in PubMed. The reference list of included studies was also searched. The literature search, title/abstract screening, the final decision on eligibility after full-text review, and data extraction were independently performed by two researchers (Z.-Y and Z.-Y.G), and the third researcher (X.-R.S) made the final decision in cases of disagreement. Articles met the inclusion criteria if they were case-control studies or provided baseline data from longitudinal studies of Cys C concentrations comparing adult ALS patients (age >18 years) with HCs and controls with several relevant NDDs. Our study used the well validated diagnostic criteria for ALS [22, 23]. Studies that used Cys C as a biomarker in the blood or CSF to differentiate ALS patients from a control group, studies provided a full description of the method used to measure Cys C levels. The following exclusion criteria were adopted: (1) studies in animals or cell lines; (2) measured Cys C concentrations in biological samples other than CSF or blood, including spinal cords, or brain tissue from biopsy; (3) used non-quantitative or semi-quantitative methods such as western blot, mass spectrometry; (4) had overlapped sample, or the sample size is less than five; (5) reviews, meta analysis, case-reports, case series or editorials were also excluded. We used the EndNote to remove duplicate data. Titles and abstracts were screened for eligible studies and full-text reviewed for potential eligible studies subsequently. If multiple studies originated from the same research center or hospital, authors were contacted for excluding overlapped samples. Sixteen papers [15-20, 24-33] were selected for the final systematic review. We used the Newcastle-Ottawa Scale (NOS) criteria (http://www.ohri.ca/programs/clinical_epidemiology/oxford.asp.) to assess 16 papers selected for systematic review. For case-control study, this scale assesses the risk of bias in the following 3 domains: selection of study groups, comparability of groups, and ascertainment of exposure. Studies that were less than 7 scores were considered to have a high risk of bias, and those with scores of 7 or more have a low risk of bias. The assessment was done independently by two authors (Z.-Y and L.-M.H). If there was disagreement, another author (X.-R.S.) was consulted to resolve the disagreement. For each included study, Two of us independently extracted the following data: author, the publication year, the country of studied population, the assay type, the sample size, gender, and the age of patients; the standard deviation of mean (SD) or the standard error of mean (SEM) of Cys C concentration, the correlation coefficient disease duration, the disease severity (ALSFRS-R) , the type of sample (CSF or serum or plasma), the type of disease. If the data for meta analysis were missing or only presented graphically, authors were contacted, and where a response was not received, we measured the data from the graphs by using digital ruler software (Engauge digitizer). All statistical analyses were used STATA software (version 14.0, Stata Corporation, TX, USA) to perform. We attempted to obtain the original data by contacting the authors of the selected papers, but the parts among them were not available. Because studies used different assay methods, we used the random effects model in order to pool the effect sizes and calculate the standardized mean difference (calculated by use of Hedges'g) and the 95% confidence interval (CI) from the mean and standard deviation of Cys C levels among patients with ALS and Controls . Where SEM was only reported, SD was estimated using the following formula: SD = SEM × Sqrt (sample size) (www.cochrane-handbook.org.). 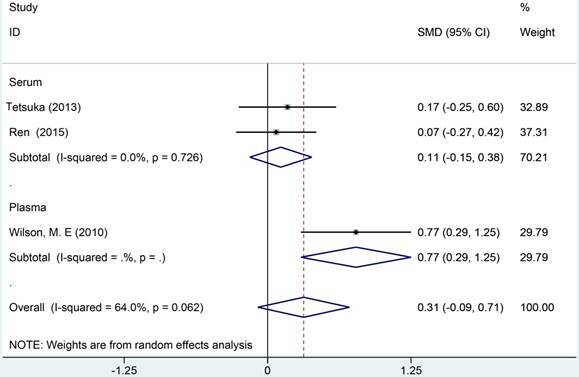 The combining of the subgroups' mean and SD was conducted using the relevant formulae provided by the Cochrane handbook for systematic reviews of interventions (www.cochrane-handbook.org.). We also used Fisher's Z test to combine the overall effect on the basis of the correlation coefficient and sample size . P < 0.05 indicated the statistically significant. Heterogeneity between studies was tested using both the I2 tests and the chi-square test. I2 statistics of 0.25, 0.5, and 0.75 were defined as the small, moderate, and high levels of heterogeneity respectively, and p < 0.1 was considered as the statistically significant for heterogeneity . In order to evaluate publication bias, we calculated the funnel plot asymmetry using the Egger's linear regression test. 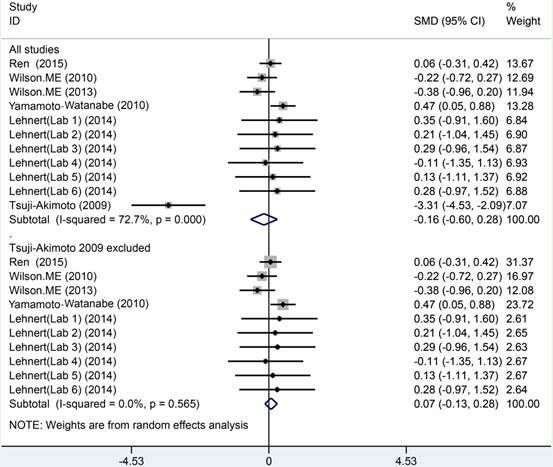 The P value of less than 0.1 showed the significant asymmetry and the publication bias . If Egger's linear regression test revealed a potential publication bias, we used Duval and Tweedie's trim and fill method to test the data. To evaluate the stability of our results, we also performed so-called leave-one-out function for doing sensitivity analyses. We conducted subgroup analyses based on the following prespecified factors: age-matched, assay type and geography. To investigate the source of heterogeneity, and investigate the differences of Cys C levels between ALS groups and distinct control groups, we also subdivide the controls into two groups: (1) HCs or controls without several relevant NDDs; (2) controls with several relevant NDDs. Following duplicates removed, 81 references were obtained from the search. After title/abstract were screened, the eligible reasons of 54 studies were assessed by reviewing full-text. Finally, 16 original studies were selected for systematical review and 7 studies were excluded in meta analysis with following reasons: (1) Used non- quantitative or semi-quantitative assay methods [15, 24, 25, 27]. (2) No valid data [29, 32]. (3) The study of Chen et al  showed that Cys C levels were great differences with other studies. Figure 1 showed the PRISMA flowchart of the selection process in our study. All studies included in the systematic review were the case-control study and the evaluated Cys C levels, whereas 8 of them were evaluated Cys C levels in CSF [16-20, 26, 30, 31], 3 studies evaluated Cys C levels in blood [19, 27, 29]. Those studies comprised ALS patients, health controls and controls with several relevant NDDs. Cys C levels of ALS patients in CSF were compared with healthy group and the different groups of neurological patients. The characteristics of included studies were presented in Table 1. The assessment of bias risk was performed according to study methods in Table 2. Six of case-control studies were assessed to have a low risk of bias. Three of case-control studies were considered to have a high risk of bias. Although ALS patients were typically well defined, the use of hospital-based instead of community-based controls was considered a potential source of bias among many case-control studies. Almost half of studies were lack of comparability of cases and controls due to non-age and gender-matched on the basis of study design. Data from 6 studies were analyzed in a random-effects model to compare the CSF Cys C levels in ALS patients and health controls, which consisted of 246 ALS patients and 150 HCs shown in Figure 2. The levels of Cys C significantly decreased in the CSF of ALS patients compared with health controls (Hedge's g = -1.398, 95%CI: -2.43 to -0.36; p = 0.008) and the significant heterogeneity was found among these studies (I2 = 94.5%, P < 0.001). In additional, the potential publication bias was evaluated by Egger's regression asymmetry test in these studies (p = 0.08), we also found a potential publication bias, but no evidence of small-study effects was observed. In these studies, the sensitivity analysis did not alter the direction or statistical significance of the effect size estimate (Figure 3). However, after we excluded one study of Pasinetti et al  because of the effect size presented a huge difference compared with other five studies, the heterogeneity was significantly decreased (I2 = 54%, P = 0.069) and the direction of results did not change (Hedge's g = -0.41, 95%CI: -0.77 to -0.05; P = 0.024). To study the causes of heterogeneity, therefore, we next performed the subgroup analysis based on the assay type of enzyme-linked immunoassay [ELISA], immunoturbidimetric assay and the age- matched design. The impact of heterogeneity slightly increased and the statistical significance was stabled for the ELISA method, but for the immunoturbidimetric assay, the impact of heterogeneity reduced by 38% and the effect size did not present the statistical significance (Figure 4). Furthermore, the age-matched studies showed that ALS patients had a tendency toward reducing Cys C levels in CSF compared with HCs, but no statistical significance was observed. The meta analysis of Cys C levels in CSF between ALS patients and controls with several relevant NDDs was conducted in six studies, comprising 234 ALS patients and 218 controls with several relevant NDDs. 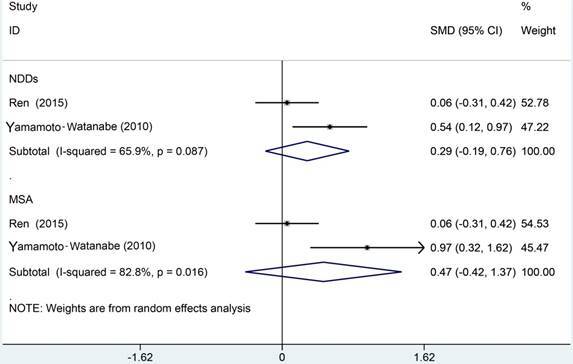 Random-effects model meta analysis showed that the Cys C levels in the CSF of ALS patients tended to slightly reduce compared with controls with several relevant NDDs, but no statistical significance existed (Hedge's g = -0.16, 95%CI: -0.60 to 0.28; p = 0.429, Figure 5). The significant heterogeneity was found (I2 = 72.7%, P < 0.001), and no publication bias and no small-study effects was observed (Egger's test: p = 0.364) in those studies. 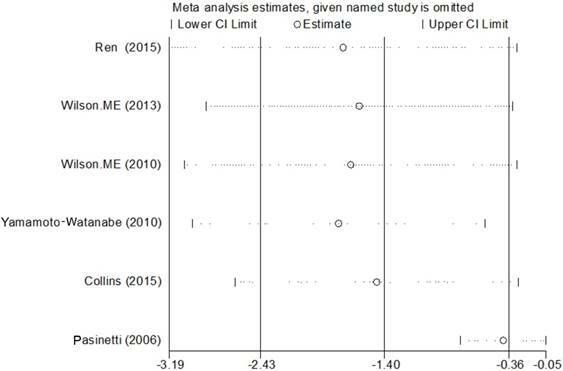 We performed a sensitivity analysis in those studies, which showed that the study of Tsuji-Akimoto et al  tended to have the great heterogeneity, hence, we excluded the article in this meta analysis and the impact of heterogeneity was disappeared (I2 = 0%, P = 0.565, Figure 6), but the p value remained more than 0.05, which indicated no statistical significance. 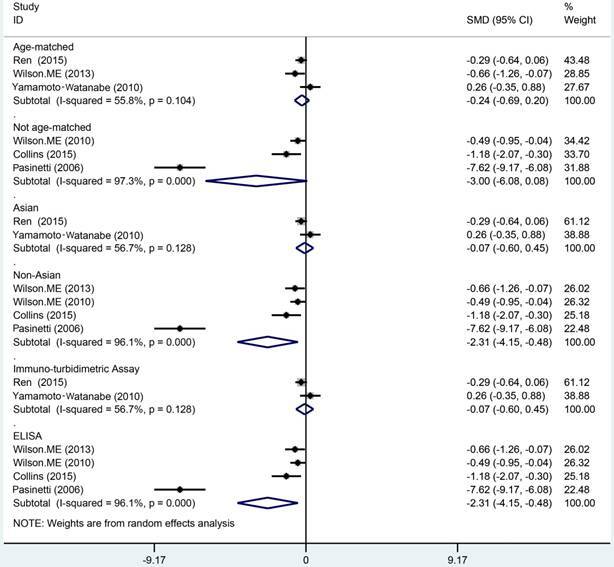 The subgroup analysis using the assay type or the age-matched design showed no statistical significance observed in each subgroup (Figure 7). In order to investigate the difference of Cys C levels in CSF between ALS patients and several relevant NDDs patients, we performed a meta analysis in ALS patients compared with multiple system atrophy (MSA), Parkinson's disease, Alzheimer's disease (AD) and Tauopathy. 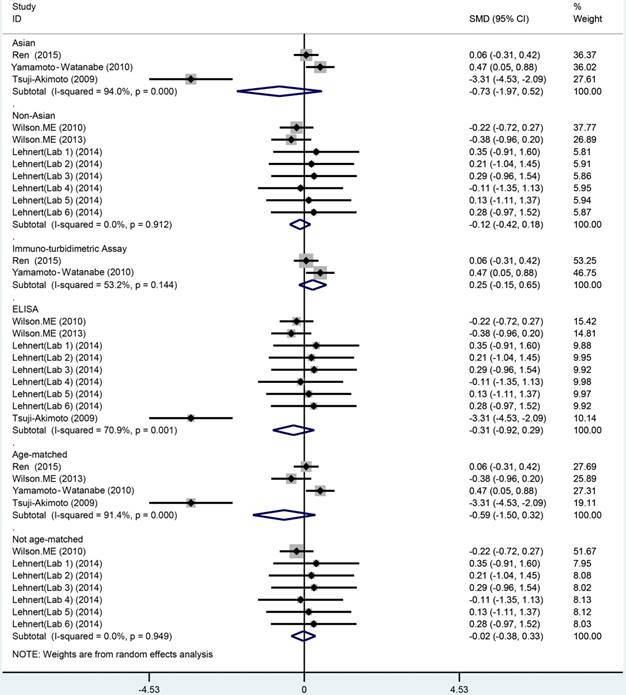 However, we did not detect a significant difference between ALS patients and MSA or other relevant NDDs patients in this meta analysis (Hedge's gNDDs = 0.286, 95%CI: -0.19 to 0.76; pNDDs = 0.241, Hedge's gMSA = 0.472, 95%CI: -0.42 to 1.37; pMSA = 0.301, Figure 8). 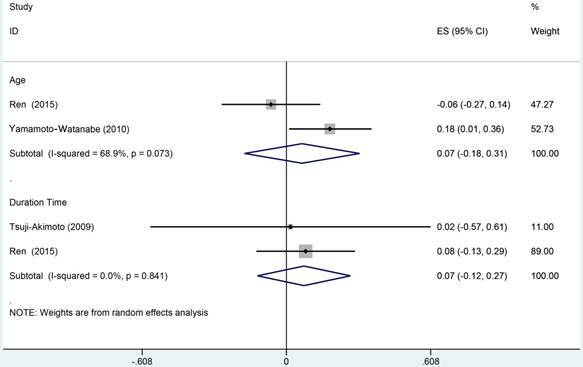 Meta analysis of Cys C levels in CSF of ALS patients versus health controls. Sensitive analysis of Cys C levels in CSF of ALS patients versus health controls. A total of 3 studies were analyzed in a random-effects model to compare the blood Cys C levels in ALS patients with health controls, which included 211 ALS patients and 109 HCs (Figure 9). Two studies [20, 29] reported Cys C levels in serum, Wilson et al  reported Cys C levels in plasma. No statistical significance was observed in comparison of Cys C levels in blood between ALS patients and HCs (Hedge's g = 0.314, 95%CI: -0.09 to 0.71; p = 0.123). The heterogeneity test showed a moderate heterogeneity (I2 = 75.3%, P < 0.001). Considered of different blood components, we selected Cys C in serum and plasma to perform subgroup analysis. No significant difference was observed in serum, but Cys C levels in the plasma of ALS patients were distinctly elevated than HCs. Due to the limited number of studies, we did not perform any further analysis. Cys C levels in CSF ALS versus HCs: subgroup analysis based on assay type (enzyme-linked immunoassay [ELISA] and non-ELISA), age-matched study and geography. We selected 3 studies, which comprised 137 ALS patients, to perform the correlation meta analysis. This has been done by investigating the relationships of Cys C levels in CSF with age and disease duration time. 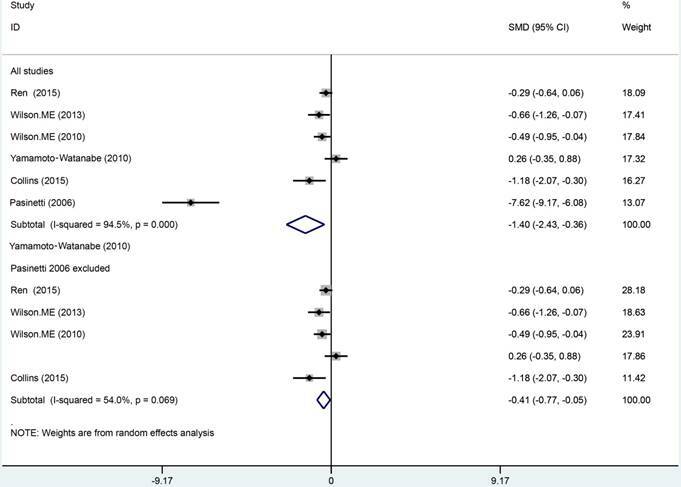 None of this meta analysis has been detected a significant correlation between Cys C levels in CSF and age (r = 0.07, 95%CI: -0.18 to 0.31) or disease duration respectively (r = 0.07, 95%CI: -0.12 to 0.27; Figure 10). Recent studies have revealed that Cys C plays neuroprotective roles via pathways that are dependent on the inhibition of cysteine proteases, or the inhibition of amyloid-beta aggregation, the induction of autophagy or neurogenesis respectively [6, 39, 40-42]. Cys C has been researched extensively in neurological diseases and had been confirmed that levels of Cys C in CSF are correlated with some NDDs, such as AD, MSA, and ALS. Prior studies suggested that the CSF Cys C was a reliable biomarker in AD that appeared a positive correlation with changes of both Abeta 42 and tau levels of CSF, independent of age, gender and ApoE genotype . It was reported that the immunoreactivity of Cys C decreased in the spinal motor neurons of ALS patients , and the reduction of Cys C in ALS might increase cysteine proteases, which mediated the degradation of extracellular proteins and hindered the regeneration or cytothesis, ultimately prompted the neuronal damage and death . Several research groups found the decreased levels of Cys C in the CSF of ALS patients compared with HCs by using qualitative or semi-quantitative or quantitative methods [16, 25-27, 32]. However, other studies showed inconsistent results [18, 20]. 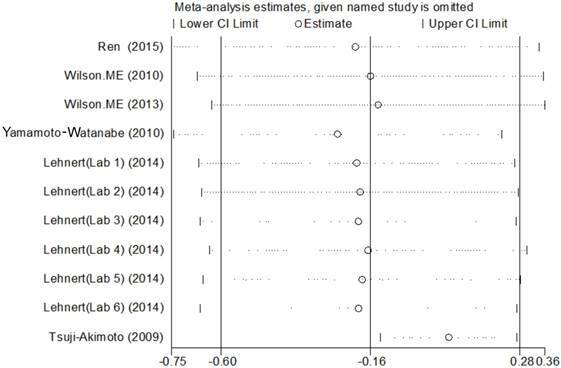 Meta analysis of CSF Cys C levels in ALS patients versus several relevant NDDs. Sensitive analysis of CSF Cys C levels in ALS patients versus several relevant NDDs. In our systematic review and meta analysis, we found that Cys C levels in CSF were reduced in ALS patients compared with HCs. Although great heterogeneity was found among included studies, the sensitive analysis showed that the study of Pasinetti et al  was the main source of heterogeneity. The results of meta analysis showed that Cys C levels in CSF decreased, but the direction was unchanged after excluded the article of Pasinetti et al. This result was consistent with prior studies using mass spectrometry and western blot. Assay type, age-matched and geographic locations (Asian or Non-Asian) was not the source of heterogeneity in subgroup analysis. However, the reduction of Cys C levels in CSF is not specific for ALS, it has been reported in several relevant NDDs such as AD and MSA. Thus we performed another meta analysis using several relevant NDDs as controls. The article of Chen et al  was excluded because the data of Cys C levels showed great difference compared with other studies after contacted with author . CSF Cys C in ALS versus several relevant NDDs: Subgroup analysis based on assay type (enzyme-linked immunoassay [ELISA] and non-ELISA), age-matched study and geography. Meta analysis of Cys C levels in CSF of ALS patients versus MSA/NDDs. Meta analysis of Cys C levels in peripheral blood of ALS patients versus health controls. Meta analysis of correlation coefficient between Cys C levels in CSF of ALS patients, age and duration time of disease. The levels of Cys C in the CSF of ALS patients did not significant decrease compared with controls with several relevant NDDs. High heterogeneity was found among these studies, but the included studies became homogeneous while the article of Tsuji-Akimoto et al  was excluded. Other relevant NDDs and MSA did not show a significant difference with ALS in the Cys C levels of CSF. Therefore, we could not believe that Cys C in CSF was a reliable biomarker to differentiate ALS with other diseases now. For instance, the levels of Cys C in the CSF of MSA were much lower than that in health controls, and similar results also were observed in AD [18, 46]. It is not enough to differentiate ALS from several relevant NDDs only using the levels of Cys C in CSF. Although the included studies became homogeneous because the Tsuji-Akimoto et al article was excluded , the great heterogeneity existed in each study because of the variety of control diseases. Hence, we selected several relevant NDDs and/or MSA as control group, but limited research has made it difficult to observe the difference between them. Both Ren et al  and Wilson et al  revealed that the poor sensitivity of Cys C levels in CSF was in the ALS diagnosis, however, Wilson et al  showed the high specificity in the diagnosis, therefore, suggested that the Cys C levels in CSF might present a limited diagnostic capacity and might still have the potential to improve the diagnostic parameters of a biomarker panel. For the levels of Cys C in blood, although Wilson et al  reported the significant reduced Cys C levels in the plasma of ALS, there was no difference between ALS and health control in meta-synthesis. Both Ren et al  and Wilson et al  revealed that levels of Cys C in blood do not have the diagnostic utility for ALS. Partially may be levels of Cys C in peripheral blood was associated with a range of conditions, such as kidney function, cancer, hypertension, cardiovascular disease, rheumatoid arthritis, as well as related to normal aging . It is noteworthy that the reduced Cys C levels in CSF are not specific for ALS. The most useful role of Cys C levels in CSF is likely to be in monitoring duration, progression or prognosis of disease. Our meta analysis did not notice a significant correlation between the levels of Cys C in CSF and age or duration time of ALS patients respectively. It is still unclear whether the Cys C reduction affects the survival of ALS. Only two studies conducted the longitudinal analysis and demonstrated that Cys C measures in CSF showed a positive correlation with the survival time of ALS patients [25, 26]. Furthermore, the functional activity of Cys C in CSF of ALS patients and controls is directly proportional to its concentration . As the above mention, the functional activity of Cys C reduces with its levels in CSF, therefore, facilitate the localized neuronal damage mediated by cysteine proteases. The pathogenesis also confirms the conclusions of these two studies. Several studies of relevant NDDs showed the reduced levels of Cys C in CSF or the increased expression of Cys C in degenerative neurons [18, 48, 49, 50, 51]. Both levels of Cys C in serum or CSF of AD patients have been shown to be lower [43, 48, 49], and the Cys C levels in CSF is strong positively correlation with alteration of both tau and Aβ42 levels in CSF . High mRNA levels of Cys C were found in caudate nuclei and cerebella of MSA patients brain  and similar results were observed in the vitro and vivo model of Parkinson's disease [51, 52]. Like AD, the levels of Cys C in CSF are seemingly decreased during disease progression in ALS patients and the reduced Cys C is negatively correlated with survival time . Cys C localized in Bunina bodies, intraneuronal inclusions that contained in degenerating neuron which is a specific pathologic marker of ALS . These findings were consistent and the results also were consistent, how to explain this phenomenon? Firstly, the elevated Cys C expression in degenerative neuron is likely part of a neuroprotective response aimed at alleviated neurodegeneration. The main neuroprotective roles of Cys C in neruodegenertive diseases are: 1) induces the neural cell autophagy, which prompts the degradation of misfolded or unfolded proteins, prevents the accumulation of aberrant mutative proteins, ultimately prevents and eliminates the neurotoxicity brought to neural cells by them ; 2) the increased Cys C expression in degeneration neural cell might represent compensatory mechanism to rescue neurons by inhibiting the apoptosis pathway activity of cathepins, thereby to prevent neurodegeneration . Furthermore, to exogenously add Cys C into mutant SOD1-link cell/mice model have shown that Cys C exerts a neuroprotection by against the misfold SOD1 protein mediated toxicity [12, 54]. The intracerebroventricular supplementation of Cys C significantly extends the survival time of early onset ALS mice model . Thus, the decreased Cys C in CSF more likely is a pathological reduction because Cys C in degenerative neurons secreted into extracellular and prompted the Cys C in CSF to tanslocate into intraneuronal inclusions or Bunina bodies. Cys C in the CSF is a marker for neurodegenerative diseases or a marker specific for ALS? Our systematic review and meta analysis further confirmed that the Cys C levels in CSF was lower in ALS patients compared to HCs and consistent with other relevant NDDs' studies. But we could not found that the Cys C levels in CSF showed a significant difference compared ALS patients with several relevant NDDs, thus, we assume the decreased concentrations of Cys C in CSF is not a specific biomarker for ALS but likely is a sensitive biomarker for ongoing neuronal injury or neurodegenerative diseases. Longitudinal alteration of Cys C levels in CSF is positively correlated with ALS survival time and suggests that Cys C in CSF may act as a biomarker of ALS progression or survival, but need further research to confirm it. Limitations in this meta analysis were following: First, although we attempted to collect all necessary missing data from the authors of studies, few studies still failed to receive a response. So we used widely acknowledged methods to extract and synthetic data. The specific method was as above descriptions. Second, the amount of included studies was still limited. The limited number of studies makes it difficult to make further analysis. Third, we also found that two studies using immunoturbidimetric assay were Asian, which showed no evident reduction of Cys C levels in ALS compared to HCs. Finally, we only analyzed English published studies, other languages studies were excluded, which may bias our research. In summary, to the best of our knowledge, this systematic review and meta analysis is the first study comprehensively investigated the association of Cys C levels between ALS patients and HCs and controls with other neurological disorders. Our meta analysis showed that Cys C in CSF might not be an effective diagnostic biomarker due to the limited diagnostic capacity for ALS, the lower CSF concentrations of Cys C in ALS patients may be an auxiliary biomarker in ALS clinical diagnosis. So far, the Cys C levels are considered as the prognosis biomarker have not confirmed yet. The subsequent research should conduct the dynamic and longitudinal analysis of levels of Cyst C in CSF of ALS patients. ALS: amyotrophic lateral sclerosis; Cys C: cystatin C; CSF: cerebrospinal cord fluid; NDDs: neurodegenerative diseases; MSA: multiple system atrophy. We gratefully thank that this work was supported by the grant committee of National Natural Science Foundation of China (30560042, 81160161 and 81360198), Education Department of Jiangxi Province (GJJ13198, GJJ170021), Jiangxi provincial department of science and technology (-47, 20142BBG70062, 20171BAB215022), Health and Family Planning Commission of Jiangxi province (20181019), Jiangxi Provincial Department of Science and Technology Gan Po Elite 555 (Jiangxi Finance Elite Education Refers to  108). All authors contributed significantly to this research and preparation of the manuscript. X.S. and Z.Y. conceived and designed the experiments and wrote the manuscript. Z.Y. Y.M. L.J. L.H. X.Z. Y.F. L.Y. C.Z. Z.G. and X.S. performed the study and analyzed the data. Z.Y. Y.M. and L.J. are the jointed first author and contributed equally to the work. All authors have been involved in the drafting, critical revision and final approval of the manuscript for publication. All authors agree to be accountable for all aspects of the work in ensuring that questions related to the accuracy or integrity of any part of the work are appropriately investigated and resolved.